Friday was full of fun and learning in Itaparica. We started the day with our friends from Quilombo, as they visited us at the house. Abby Mihaly and Natalia Tu led us all in our first icebreaker, playing the game “wha.” Laughing along with our new friends, we then all participated in a “common ground” activity that helped us see our commonalities and differences, and sparked some good discussion on privilege and access. The rest of the morning was dedicated to learning braiding and percussion, as our two groups mixed together and got to know each other more. After bidding farewell for the day to our friends, we all went around to discuss one picture that we’ve taken that shows some of the themes of the trip. Sophie Margola shared a picture from the sun setting on our last day in Praia do Forte. For her, the picture symbolized the reflection that we are all doing while in Brazil. In the evening, Javier arranged us for us to visit a Catholic mass. Even for those in the group that had been before to a Catholic service, there were striking and distinct characteristics of the service in Itaparica. The group had some great questions as we walked back on the beach with a setting sun hanging over us. In the evening, we were fortunate to have a guest from Quilombo spend some time with us. 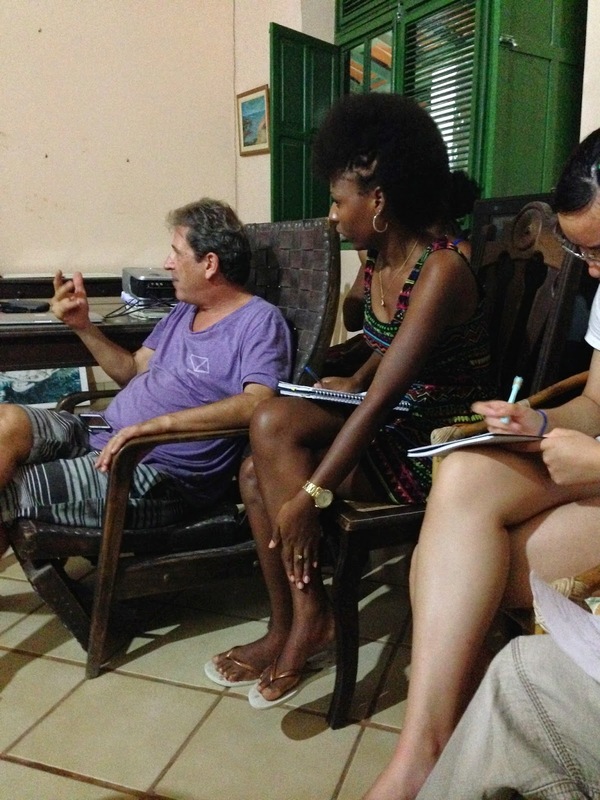 Mari Gomes, is studying Portuguese literature, and took questions from the group that helped us better understand the context of Jorge Amado’s novel, “Gabriella, Clove, and Cinnamon, that we read. As Mari wrote later on, “It was very interesting to hear criticisms of Jorge Amado, and the Brazilian obsession with Disneyland from Brazilians” directly. Vicky Fong and Trung Huynh delivered presentations on the environmental issues and politics, respectively. Vicky’s presentation was particularly apt as we prepared for our early morning opportunity on Saturday to clean the beach with our friends from Quilombo. As we put an end to a long day, we asked the group to reflect on what they learned today that they couldn’t have learned back home. Sophia Zhu wrote that, “by being here, I learned a lot more about Brazilians’ every day life….The women [from Quilombo] were full of smiles, laughter and dance moves, which seemed to be integrated into their daily life... However, I also know that those are not the only thing Afro-Brazilians do. There is also an intellectual aspect to their life." The students that we worked with only spoke Portuguese and it was particularly difficult to communicate with them because I know very little.” However, “I met every kid and looked them in the eyes and communicated with gestures and smiles and a translator here and there.” Additionally, “At the Good Friday service, I could not understand a word, but a few jumped out me….language barriers are not easy to navigate, but once you get past it, you can unlock many doors to things you never knew before!! 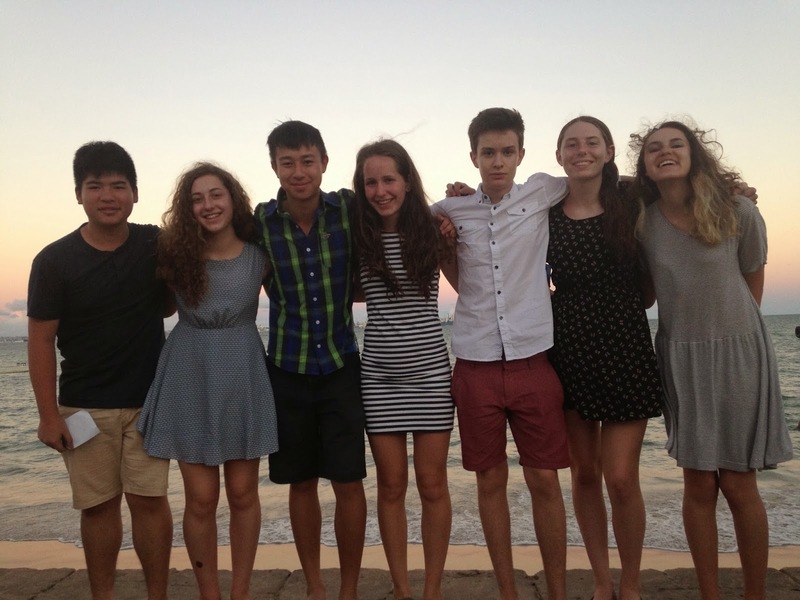 Finally, for Sophie Basescu, it was the experience of meeting and working along side peers from Quilombo. Doing the [common ground] exercise with the students from Quilombo, I learned something that I needed to experience in order to understand. When Grant was calling the statements, I felt uncomfortable. I did not like that there was such inequality between us…I have always known that I have led a privileged life, but I had never really understood the implications that it has had Whether it’s college or traveling or smartphones, I understood the privileges given to me in life.